Living Produce Aisle, a new concept store that combines your local grocer, smoothie bar, and kitchen appliance store, will be holding their grand opening on Saturday March 7, 2015. It will sell fresh and nutritious juices and smoothies, flats of a variety of live greens, and Urban Cultivator appliances. Urban Cultivator appeared and signed a deal with Arlene Dickinson on Dragons’ Den in 2011, and has since been adapted by many Canadian restaurants, including Four Seasons Vancouver and Fairmont Pacific Rim. 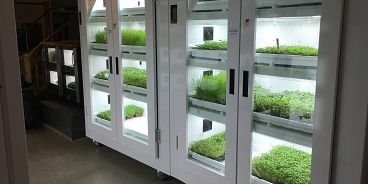 It is also a favorite of Martha Stewart, who strongly believes that Urban Cultivator units are amazing products. Now, Urban Cultivator is hoping to bring fresh beverages to Vancouver, serving smoothies and juices to the neighbourhood, and providing those in the city with fresh, live produce that is grown right at Living Produce Aisle. “The goal is to help people be sustainable and self-sufficient,” Urban Cultivator CEO Tarren Wolfe says of Living Produce Aisle. Through growing one’s own food, Mr. Wolfe knows that we can drastically reduce our carbon footprint. Restaurants nearby will be able to purchase full flats of greens for a fraction of the price they would pay wholesalers. Living Produce Aisle is located in the heart of Yaletown at 1168 Hamilton Street, roughly one block away from the Yaletown-Roundhouse stop on the Canada Skytrain Line. It is open from 8:00am to 8:00pm from Monday to Saturday, and 9:00am to 7:00pm on Sundays.